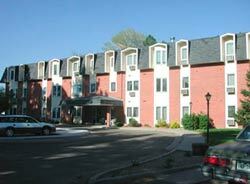 Tabor Apartments is a low-income 30-unit apartment building of independent living. Twenty-three apartments are one-bedroom units and seven are studio apartments, some with a paneled wall between the living area and the bedroom. 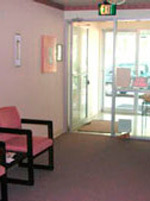 Tabor is physically attached by a walkway to Even Ezer Lutheran Care Center. Rent is based on a HUD formula. Large living rooms with TV outlets and a telephone jack. Drapes are furnished. Bedrooms are large enough for a double or queen size bed. Bathrooms have a tub and shower plus cupboard space. Safety holds are installed as needed. Kitchens are furnished with refrigerators, stoves, garbage disposals, hoods over stoves, ample cupboard space and a smoke detector. Each apartment has four closets: two for hanging clothes, two with shelves and storage room for vacuum, etc. 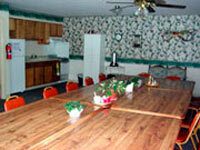 The first floor has a commons room with full kitchen facilities for use by residents and their guests. A coin-operated laundry room with two washers and two dryers is located on the second floor. Several game tables are located on the third floor open area. 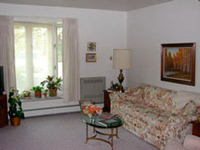 All apartments have carpeting and air conditioners. A large parking lot (snow removal furnished) and some carports are available. Post office, laundry, trash removal, etc., are available indoors without having to go outdoors. Outside doors are on a security system. An applicant must be low-income, a senior citizen (62) or on disability. Income includes social security, any retirement income, interest from bank accounts, CD’s, Annuities, etc. Before figuring rent, deductions may be made from income for medical insurance, prescriptions used for chronic health conditions, eyeglasses, dental work, etc. HUD also allows a $400 deduction before determining income. Rent includes heat, cooling, lights, trash removal, water, etc. The telephone is your own expense. The rent is 30% of your adjusted income after expenses. Any activities at Eben Ezer are open to Tabor residents. 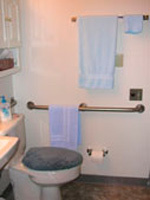 County Express bus is available for doctor visits, hair dressing appointments, grocery store shopping, etc. Rates vary. Tabor sponsors covered dish luncheons held periodically, coffee get-togethers every Friday morning, groups get together for card games, dominos, etc., on various afternoons and Saturdays. A lunch meal is available from Eben Ezer in the common area on the first floor, or may be delivered to your door. Rates vary.